The mother of an 8-year-old Palmdale boy was sentenced to prison for life and her boyfriend will be sent to California's death row for the child's horrific torture death, a case that the judge called "nothing short of evil." Gabriel Fenandez was routinely beaten, starved, forced to sleep in a closet and tortured until his death in 2013. Isauro Aguirre, 37, and Pearl Sinthia Fernandez, 34, appeared before Superior Court Judge George G. Lomeli in a downtown Los Angeles courtroom Thursday for sentencing in the May 2013 killing. Pearl Fernandez was sentenced to life in prison without the possibility of parole. Her boyfriend was sentenced immediately after the judge read her sentence along with strong words for the couple. "The conduct was horrendous, inhumane and nothing short of evil," said Judge George J. Lomeli. "It's unimaginable, the pain that this child probably endured. Gabriel was a kind, loving individual who just wanted to be loved. "You want to say that the behavior was animalistic, but that would be wrong because even animals know how to care for their young." Pearl Fernandez read from a statement during Thursday's court appearance. "I want to say I'm sorry to my family for what I did," Fernandez said. "I wish Gabriel was alive. Every day I wish that I made better choices." Jurors recommended last Dec. 13 that Aguirre be sentenced to death after convicting him of first-degree murder and the special circumstance allegation of murder involving the infliction of torture. Prosecutors argued that he hated the boy because he thought the child was gay. Fernandez pleaded guilty Feb. 15 to first-degree murder and admitted the torture special circumstance allegation in exchange for a life prison term without the possibility of parole. She had been facing a possible death sentence if the case against her had gone to trial and if she had been convicted as charged. The boy's family was consulted about Fernandez's plea. The prosecutor said he was "relieved for the family members," particularly the boy's older brother and sister, who offered emotional testimony in Aguirre's trial about abuse their younger brother had suffered. One of the boy's cousins, Emily Carranza, spoke directly to the defendants Thursday, saying the boy was an "innocent child who didn't deserve the abuse." "Pearl, you need to know that Gabriel loved you, and all he ever wanted was acceptance from you," Carranza said. "The world fell in love with Gabriel as their own. Why couldn't you?" Carranza earlier said she was relieved by the plea, which spared family members from having to go through a second trial stemming from the boy's killing. The boy's first-grade teacher, Jennifer Garcia, who called authorities to report that the boy had asked her if it was normal for a mother to hit her children with a belt, was also among those in court. "I just remember that no matter what, I can't bring him back," she said. "I can't change what happened... For me, it will never go away. This will always be a part of me, something I will think about until the day I die," said Garcia. "But I know who is truly to blame. We can blame different people for what should or should not have been done. But when it comes down to it, the defendants are the ones who ended his young life." She earlier recalled Pearl Fernandez telling her out of the blue "I don't hit my kids" when they were discussing the boy at a parent-teacher conference. During her testimony in Aguirre's trial, Garcia said it fell to her to explain to the boy's classmates at Summerwind Elementary School in Palmdale that he was not coming back to class because he had died. Los Angeles County Fire Department personnel went to the family's home in the 200 block of East Avenue Q-10 in Palmdale on May 22, 2013, in response to a call that Gabriel was not breathing. He was declared brain-dead that day and taken off life support two days later. During Aguirre's trial, prosecutors told jurors that Gabriel Fernandez was routinely beaten, shot with a BB gun, forced to eat cat feces and sleep inside a small cabinet while gagged and bound. Hatami called Aguirre an "evil" man who "liked torturing" the boy and did so systematically in the months leading up to the child's death. Aguirre hated Gabriel because he thought the boy was gay, according to the prosecutor. 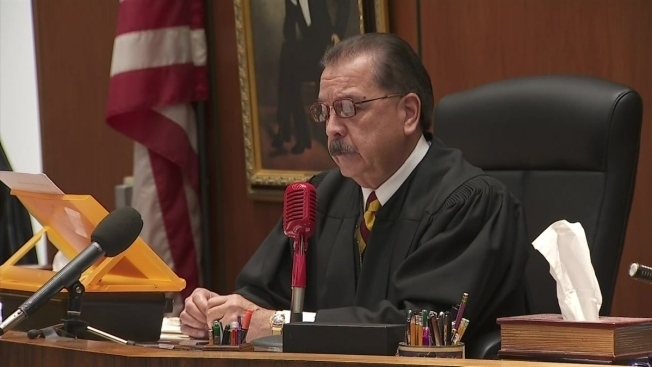 One of Aguirre's attorneys, Michael Sklar, contended that Fernandez was the one who hit the boy with a belt, shot him with a BB gun and was responsible for much of the abuse prior to his death. "I think they both pointed the fingers at each other, which sometimes happen in co-defendant cases," Hatami responded after Fernandez's plea. "The evidence showed and our office believed that they were both equally culpable in the case, and I think the evidence showed that." The boy's death and the arrests of Fernandez and Aguirre led to an outcry over the handling of the case by Los Angeles County social workers, who had multiple contacts with the family. A subsequent investigation led to criminal charges being filed against two former social workers -- Stefanie Rodriguez and Patricia Clement -- and their supervisors, Kevin Bom and Gregory Merritt. They are awaiting trial on one felony count each of child abuse and falsifying public records involving the boy.